Twitter and American Apparel are releasing a case study today, citing a campaign the manufacturer-retailer ran last year that garnered $50,000 in revenue for a single flash sale via the social platform. Adweek interviewed the Los Angeles-based brand's director of marketing, Ryan Holiday, to get insights on why he thinks Twitter is an important sales engine for the company. American Apparel currently has 466,000 followers, which Holiday said represents about a 40 percent increase compared to two years ago. The growth has been chiefly organic, leveraging the brand's existing properties while not purchasing Twitter's followers-based Promoted Accounts ads. (That said, the marketing exec said Promoted Tweets are regularly bought to push offers.) A peek at American Apparel's Twitter account quickly reveals the firm uses the same sexualized imagery (including the picture below that's currently making the media rounds) on the platform that it's become known for via billboard and print promos. When asked how often American Apparel uses Twitter's popular video app, Vine, Holiday gave a somewhat surprising answer: "I would say every week or two." Below are five reasons why Holiday is amped about Twitter marketing going into the 2014 schedule. 1. It gets newly created products to market more quickly. "Your typical fashion retailer rolls out its products in seasons or a relatively limited amount of new products per year—if only because they ship from overseas," Holiday explained. 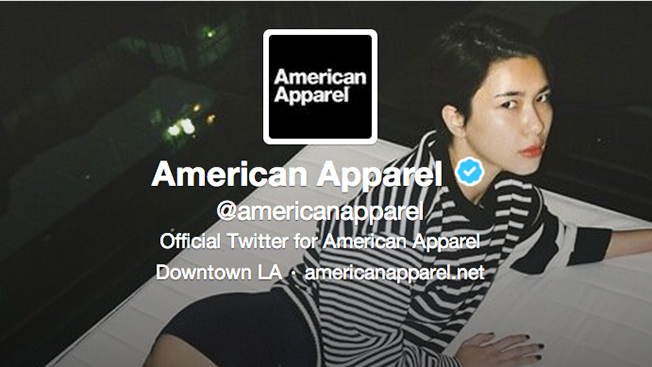 "At American Apparel, we can create, sew, market and ship brand new garments in as short as a week. So by being able to use Twitter to market and announce our new products, we're able to support this manufacturing model." 2. It complements and enhances email marketing, he said. Holiday's team thinks Twitter's relatively new lead-generation cards—which allow marketers to register users and their emails for promo or memberships within a tweet—work in that regard. "Email is always going to be best medium to talk to your fans because it's direct," Holiday said. "What Twitter is doing with Twitter cards though is allow people to use Twitter to acquire email addresses. We've had a great deal of success there … Facebook is out there giving you ways to communicate via email with your fans, and so we're really excited and pleased that we have that ability with Twitter." 3. It's more dynamic than email due to two-way communication. "We use Twitter for announcements, giveaways, sharing photos, having contests, customer service—basically anything you can think of," Holiday said. 4. Twitter has become more visual. "Images definitely improve how a tweet does. We're an imaged-based brand, and I think our fans respond to photographs, ads and graphics," Holiday said. 5. If need be, it helps save the sale department's bacon late in quarters. According to Holiday: "Twitter is an asset we turn to to meet and beat sales goals—it's an immediate, efficient and fun way to drive sales, drive awareness and engage with our customers."